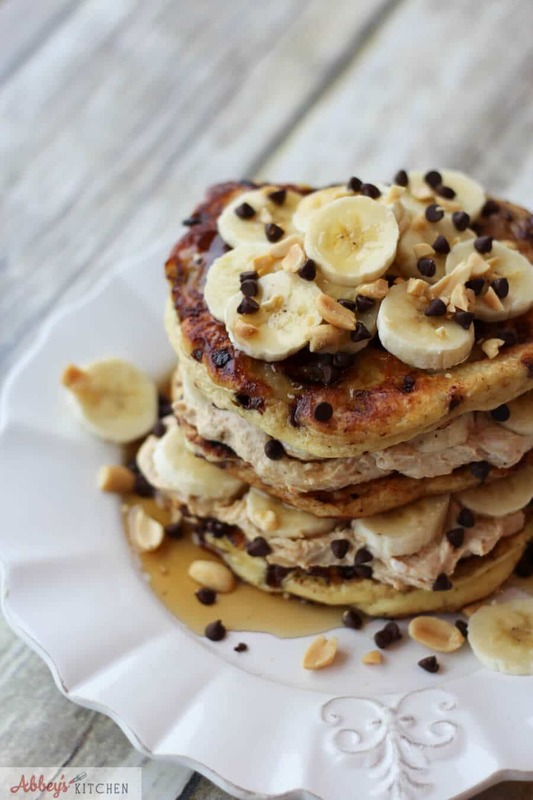 These crazy yummy stacked chocolate peanut butter banana protein pancakes are totally gluten free, low in fat and packed with high quality fermented dairy protein. I recently had you oogling over my Strawberry Cheesecake Protein Pancakes layered with a cheesecake yogurt cream and a delicious strawberry sauce. They are a pretty beautiful thing to wake up to, if I do say so myself. 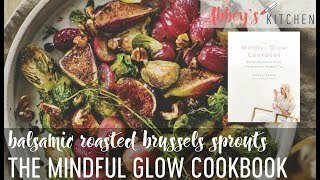 If my analytics are any indication, you clearly were digging them- A LOT- which inspired me to go back to the kitchen and dream up some other tasty pancake pleasures. Next up, I had to tackle my craving for Chocolate Peanut Butter Banana Protein Pancakes. 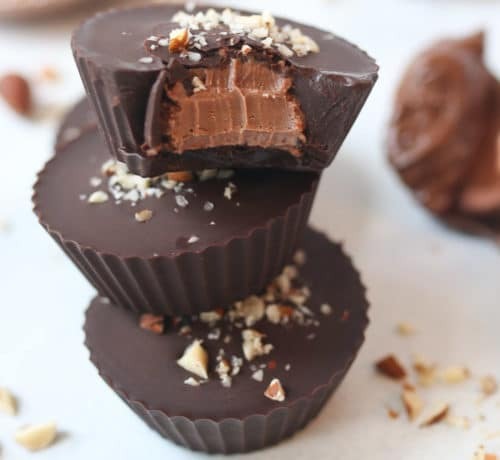 Anyone who reads my blog knows that I’m a fan of the chocolate peanut butter banana combination – I’ve made a smoothie bowl, muffins, chocolate PB cups and a high fibre smoothie. I’m kind of obsessed. Obviously, making Chocolate Peanut Butter Banana Protein Pancakes was the next natural step. Guys, these are protein pancakes, so it has to start with the best quality protein. 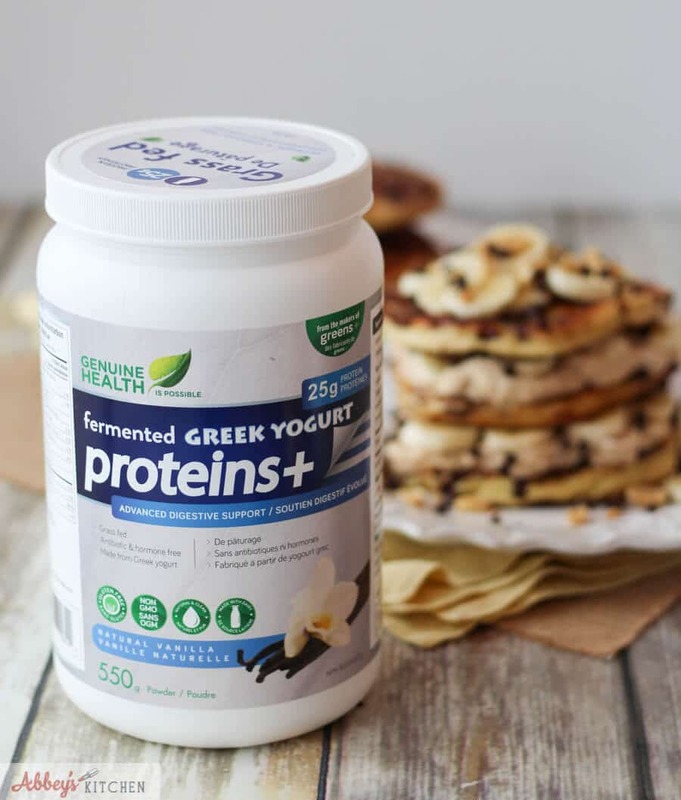 When I heard Genuine Health was launching their fermented Greek Yogurt proteins+ protein powder, I knew I would be doing a lot of baking with it. I’m always looking for ways to sneak more protein into my diet and fermented dairy protein is definitely my top pick. 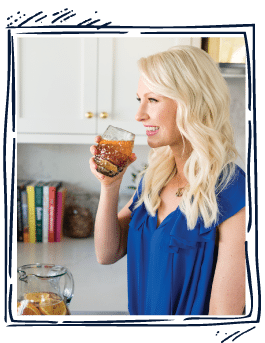 I’ve written about fermented foods and their gut-protective benefits here before, but to review, fermented foods help aid in good digestion and promote gut health. And while there aren’t any live active bacteria in Genuine Health’s Fermented Greek Yogurt Proteins+, the bacterial cultures they use in the fermentation process can essentially counteract the bloating, gas and unpleasant cramps a lot of people complain about with regular whey. Also, Genuine Health’s protein powder is totally free of gluten, wheat, artificial colours, or sweeteners, is non-GMO, and packs a whopping 25 grams of protein per 130 calories. Plus, the fermentation process is not only is beneficial for gut health, but also helps amplify the nutrients native to milk. The result? 3 times the calcium and 10 x the vitamin D of whey protein. Hello! It’s a staple in my house for a reason. 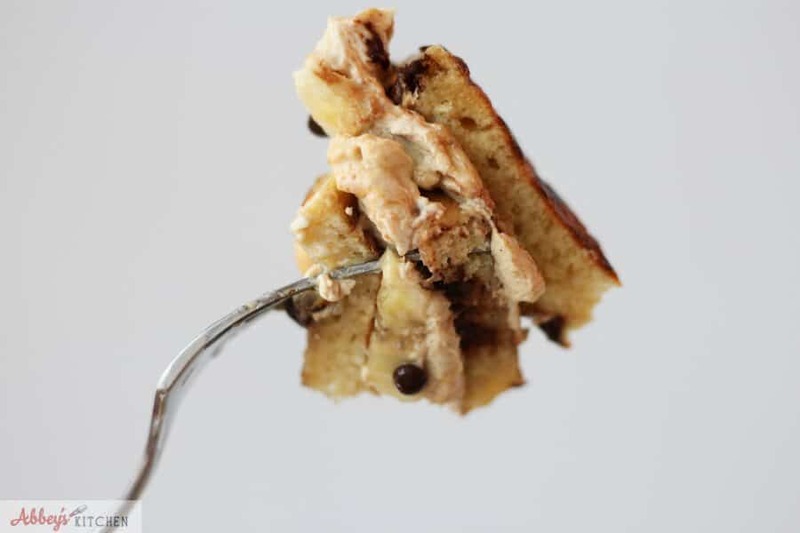 These gluten free Chocolate Peanut Butter Banana Protein Pancakes start with my classic protein pancake base, then I add sliced bananas, mini dark chocolate chips as they cook. The filling is simply plain 0% Greek Yogurt mixed with some all natural peanut butter. Then the whole thing gets topped off with crunchy salted peanuts so you get the whole sweet and salty tingles going on. It’s really, really good. 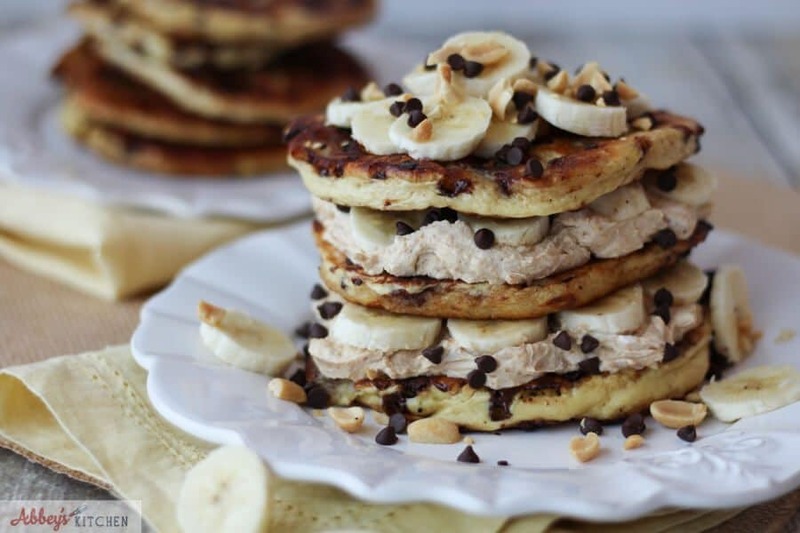 You know who would totally appreciate these Chocolate Peanut Butter Banana Protein Pancakes? MOM for a Mother’s Day brunch. Mom’s LOVE pancakes, and we love mom, so what better way to show how much we care than with a little boost of protein in the morning? I would say this is way more thoughtful (and cheaper) than a token box of chocolates or day at the spa. 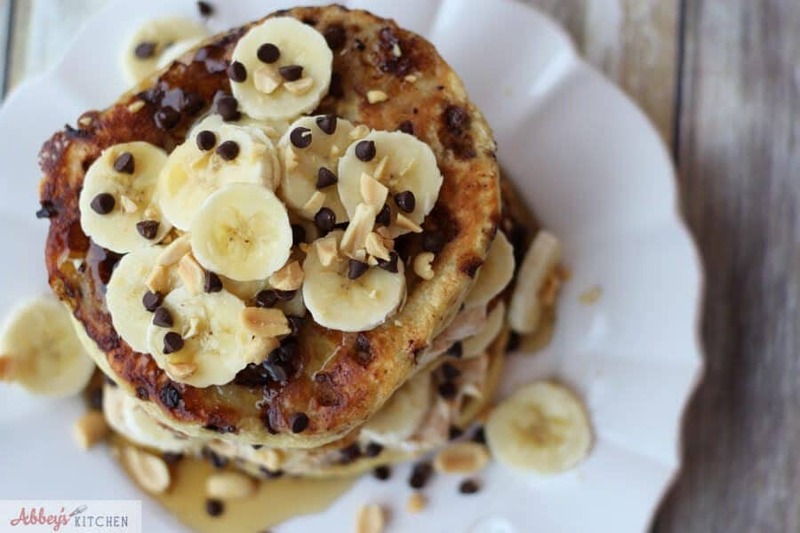 Have you tried these gluten free Chocolate Peanut Butter Banana Protein Pancakes ? 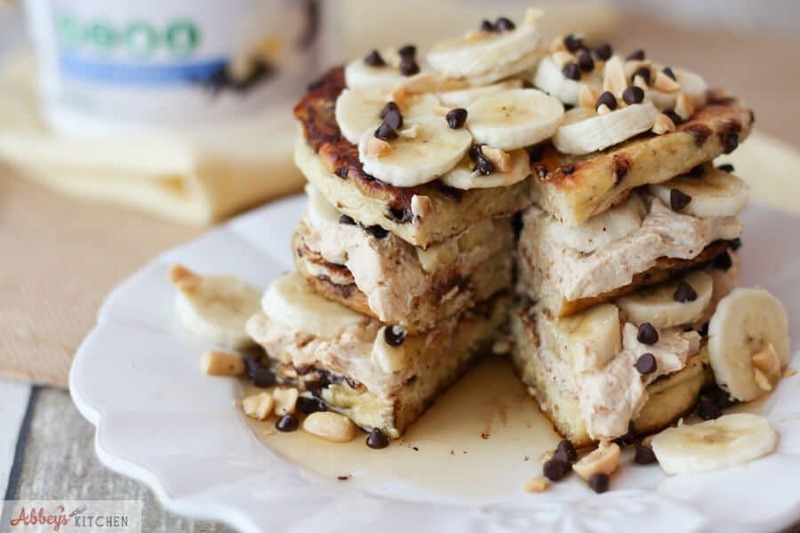 What are your favourite protein pancakes combinations? I have another one in the works, but let me a comment about what YOU would like to see! 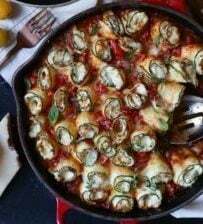 Heat a large nonstick skillet over medium heat and grease with nonstick cooking spray, oil or butter. Pour the 1/4 cup circles of batter into the pan. 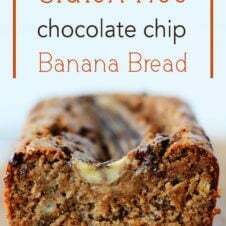 Add a few pieces of banana and chocolate chips. Once you see bubbles form around the edges, flip and continue to cook until golden brown on both sides. Keep pancakes warm on a plate tented with foil. Meanwhile, mix together the yogurt, peanut butter and honey until smooth. 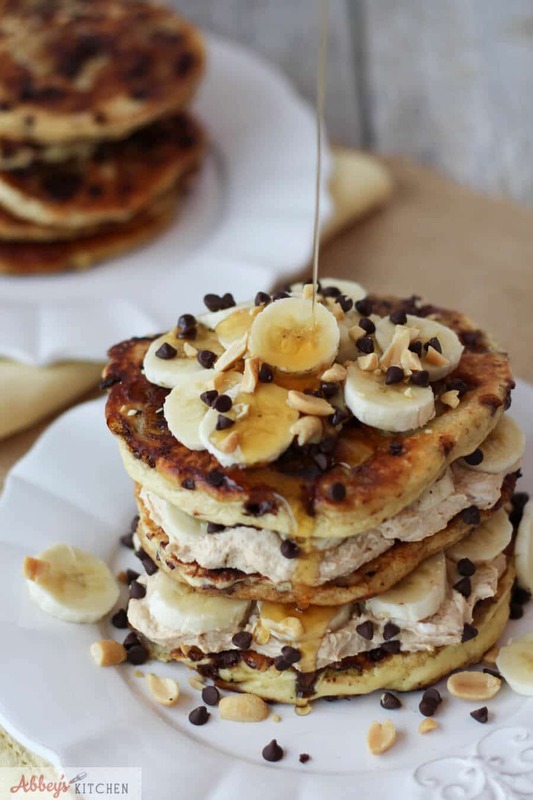 To assemble, dollop a few spoonfuls of Peanut butter filling between the protein pancakes and garnish with additional chocolate chips, banana and peanuts. 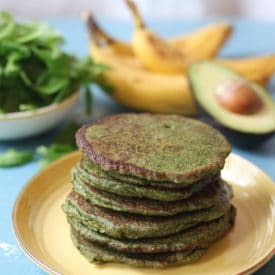 Baby Spinach and Avocado Green Pancakes | BLW Easy Finger Foods for Kids Gluten Free Chocolate Chip Banana Bread | Dairy-Free & Super Moist! 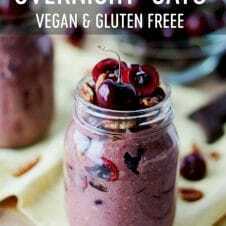 Chocolate Cherry Cobbler Overnight Oats | Vegan, Dairy Free, Gluten Free! Next Post PCOS Diet Part 1 – Is Weight Loss the Only Answer for Polycystic Ovary Syndrome? I think there may be some mistaken overlap between these and the strawberry cheesecake version? The ingredients and insTructions dont match up. Thanks and caNt wait to try them!